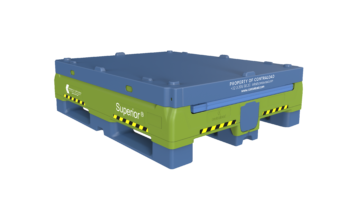 Aartselaar, Belgium: Contraload (www.contraload.com), the European market leader in plastic pallet pooling, has announced the latest addition to its liquid container pooling range – Superior. Production began in November and Contraload is now offering these new state-of-the-art liquid bins to current and new clients. Superior is the most hygienic and safe reusable IBCs on the market, ideal for high-value liquids as well as ingredients logistics. Its 70% folding ratio and easy stacking features will allow 182 empty bins to be transported in a standard European truck. It is water and dirt proof with a 100% safe, easy-to-clean design from base to lid make this bin ideal for pooling. The double wall structure provides an exceptional strength and durable performance with a 1500kg unit load. Its standard 1200X1000 footprint in conjunction with 1000L capacity and rackability, make the bin usable for all companies in Europe. Contraload has chosen not to offer its customers a wide variety of liners, glands, and valves. Instead, it offers expert advice on both filling and emptying, and simply supports its customers in buying directly from the liner producer. “To get the right liner in the Superior, we are partnering with a selection of liner producers in different countries, making sure customers get the best bag for the job. They can buy directly from the producer and keep prices low,” says Ebo De Muinck, Product Manager Liquids at Contraload with over 20 years of experience in liquids. 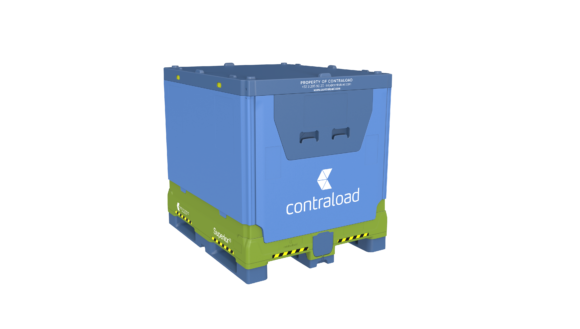 Contraload offers Superior as well as its other plastic pallets, containers and related equipment through its pooling model. Pooling is increasingly recognised as a preferred approach for the circular economy. The repeated reuse and sharing of equipment improves its utilisation while lessening the environmental impact. And with a “pay-per-use” business model, customers enjoy the use of premium quality equipment without having to purchase it, as well as the flexibility to order as needed to meet production peaks. Elements can be added or taken out to best meet the needs of customers. Besides its head office in Aartselaar near Antwerp, Belgium, and operating pan-European operations, Contraload also has offices in France, Italy, Spain, Poland, Turkey, and the United Kingdom. For more information on Contraload’s plastic pallet and container pooling solutions, visit www.contraload.com.